Sony finally announced their 500mm f/4 lens that was been on display at show for years. Shipment is expected in late March 2012. The SAL500F40G is ideal for sports, wildlife and demanding imaging applications that require extreme magnification with uncompromised optical performance. The ruggedly-engineered SAL500F40G copes effortlessly with tough photo assignments. Focusing ring and front/rear joints are protected by interlocking seals that shrug off dust and moisture, even when you’re shooting outdoors in driving rain or arid desert conditions. This weather-resistant design makes the SAL500F40G a perfect partner for the SLT-A77 (α77) Translucent Mirror camera that offers serious photographers similarly ruggedized performance. 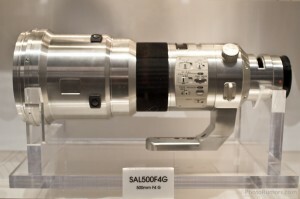 Inside, the advanced optical design of the SAL500F40G includes 11 elements in 10 groups, including three ED (Extra-low Dispersion) glass elements. It’s also the first G Lens from Sony to feature advanced new coating process that ensures crisper, clearer images. Exclusive to Sony, the ground-breaking Nano AR Coating process cuts internal reflections by up to 80% compared with previous models. Resulting images are brilliantly crisp and clear, with dramatically reduced lens flare and ghosting. Flare is reduced still further by the carbon fibre lens hood that’s lined with black velvet fibres to absorb incident light. Razor-sharp autofocus performance makes the SAL500F40G ideal for capturing an athlete’s explosive movements or the unpredictable flutter of wild birds. The high-torque SSM (Super Sonic wave Motor) features a new drive circuit, ensures rapid, responsive AF with up to 4x faster object tracking than conventional Sony lenses. Serious enthusiasts will also welcome a strong emphasis on enhanced handling and ergonomics. Four focus hold buttons are spaced around the lens barrel for easy operation in any position. They’re complemented by a two-way DMF (Direct Manual Focus) mode button and focus range switch for positive, fumble-free operation when you’re shooting under pressure. 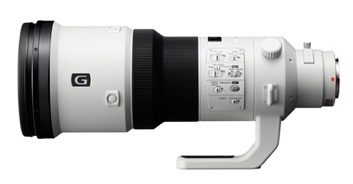 Built to order, the SAL500F40G super-telephoto lens from Sony is available in Europe from late March2012. Tokina to start producing lenses for Sony Alpha mount?